Please select an option Small Medium Large X-large 2x-large 3x-large 4x-large 5x-large Please select a Size. 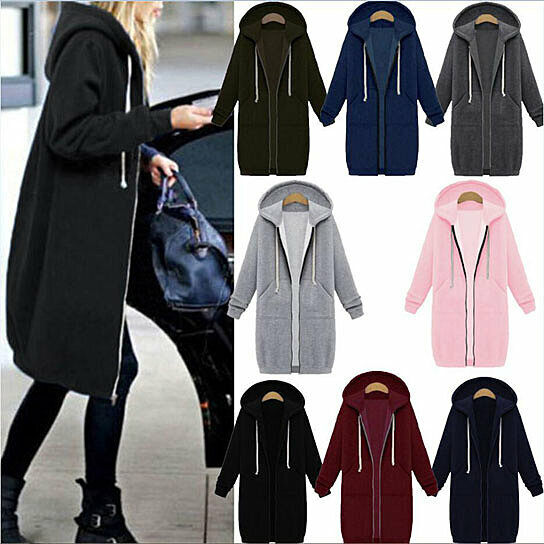 Full zip design with drawstring;Fleece and pocket design can Keep your warm during cold season,casual loose style is suitable for all types of shapes.Stylish and Cozy outfit for ladies or teenager girls. Occasions: Suitable for both home and outdoor, such as daily wear, office, school, workout, vacation, date and so on. You can wear a slim t-shirt or sweater inside, pair it with your jeans, leggings, slacks and boots. Small : Bust 39.4" Sleeve 23.6"Length 37.4"
Medium : Bust 41.4" Sleeve 24"Length 37.8"
Large : Bust 43.4" Sleeve 24.4"Length 38.2"
X-Large: Bust 45.4" Sleeve 24.8"Length 38.6"
2X-Large: Bust 47.4" Sleeve 25.2"Length 39"
3X-Large : Bust 49.4" Sleeve 25.6"Length 39.4"
4X-Large: Bust 51.4" Sleeve 26"Length 39.8"
5X-Large: Bust 53.4" Sleeve 26.4"Length 40.2"